In this kinetic new poetry from Sherwin Bitsui, characters live in a state of fading and blurring, appearing as though photographed or filmed. Dissolve hums with the coexistence and dissonance of landscape and waste, crisis and continuity—with Navajo thought inherent to the movement of the book. Wielding one of the most deeply intuitive, uncompromising poetic voices of our time, Bitsui marries past and present, urban street and wilderness, "the afterbirth of sirens glistening over him." 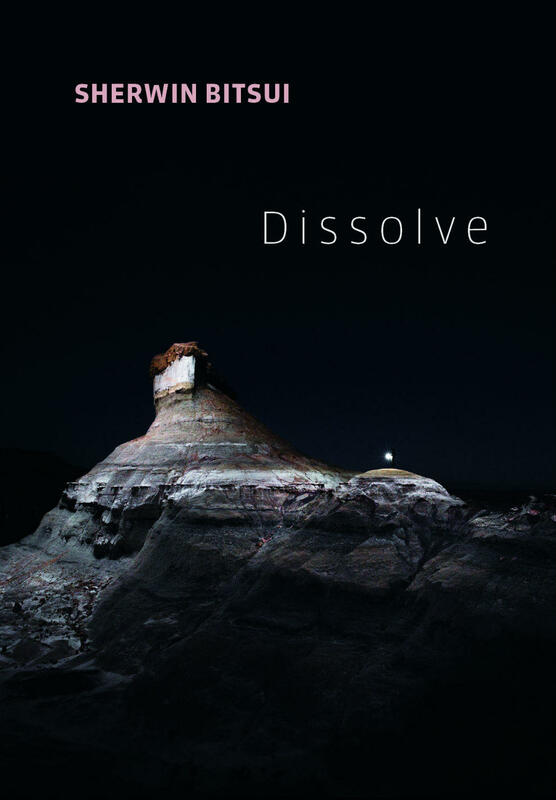 The following highlights are from a conversation with Sherwin Bitsui about his collection of poems, Dissolve. To hear the full conversation, click the link above or subscribe to our podcast. Your work has been called that of the "urban Navajo experience." What are you translating here? I’m translating the present and it’s the only truth I know. My poems are all things that are present in my time and space and imagination. I need this time to compose the works, or should I say my poems need this time. This moment is the air and the blood and the circuitry of my poetics. I did grow up in a traditional Navajo family on the Navajo reservation. My grandparents didn’t speak English. I am fortunate enough to know my language and know that I speak a language that is of this hemisphere and of this land. That root system is deep. That root system, the connections I make within that language to my time and my place, sometimes goes up against English in a very profound way. I feel the two languages orient oneself to different modes or different relationships with place, family, community, and somewhere within that translation or transmission, there is some energy that happens. I feel like my poems are trying to contain all those elements, and harmonize them and make them beautiful. One of the ways I know your work is by your verbs. In Shapeshift, you river and in this collection you use the verbs: to swan, to mountain, to window, to sister, and to sunlight. I’m thinking about your use of language. What else can you say about your use of language. As a speaker, you don’t rely on the narrative “I.” You step out of the way. What do you know about that instinct? I think it’s rather intuitive. I have learned over time to step out of the way of my own poems and trust the poem. When I was teaching at the University of Montana. I remember at one point in the MFA graduate class, I asked everybody to be vulnerable. That’s one thing I know about poetry: you can’t will a poem, you can’t make it happen. At least I cannot make a poem happen. A poem happens on its own terms. A poem guides you. It guides you into spaces or scenes and images that are sometimes difficult to see. The strategies for creating a poem or the ways that I use the verbs, is that the whole world has some force and energy to it. Even language can move you towards something. And you just have to flip the switch on and allow those things to be energized with whatever force moves them through. I think language has that ability. So they do have movement. I would be really happy if we could verb everything and see the world that way. Imagine if somebody said, “Please sunlight this room.” What does that mean? That changes everything in the way we see things. I know there’s that particular poem in Dissolve where “this mountain stands before me mountaining.” I always look at mountains and mountains are always themselves, everyday you know. Somebody mentioned yesterday at the writer’s retreat that the Teton Mountains grow four inches every year or something. I might have misheard that but I really love that image and what that means because over the span of somebody’s lifetime those mountains also grew several feet. I think that’s really beautiful. I’m so glad you brought up teaching here, because, full disclosure to our listeners: you were my own teacher during my poetry MFA and I very much remember the day you had us pick a partner in class and had us look into their eyes for minutes on end—to the point of discomfort. I remember you said that’s how you said a poet or a writer should face the blank page, with that level of openness and vulnerability. What other strategies do you use to stay open in a world that often asks us to close? Vulnerability is a power, it’s a strength. Yes, for the poem itself we do have to look straight at things. We can’t necessarily avoid the reality. Even though my poems may seem imaginative in so many ways, everything in the poem exists in some way in the world. There’s a line later on and an image of children in floating cages with police dogs barking at them. I wrote that image years ago. I don’t remember when I came to that image but it was shocking. I’d rather see that in a poem than in real life. When I saw the children on the border, the children of these migrant families in cages, or to even have knowledge of them in cages was more shocking. It really threw me off. I wrote those things in poems and they’re okay but if you see them in real life it’s very frightening. When I was in this particular class and when that moment happened, I wanted to show my students that you have to look deep and straight and not avert your eyes. That’s the moment when a poem occurs, and you have to find a way to transmit that particular feeling onto the blank page. It’s a great privilege to be a poet and it’s a very careful art. It’s not just something one does or spits out. It’s something one actually walks with and carries for a long time, and is very careful with every detail of it. Every sound, every texture, every word, every aspect of a poetic line matters and has concreteness in the world. It becomes a made thing. 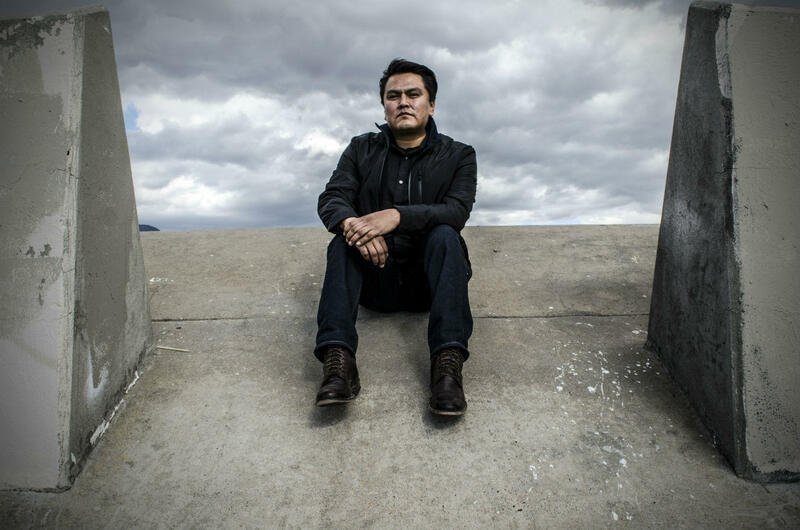 Sherwin Bitsui (Diné) is the author of Flood Song (Copper Canyon Press) and Shapeshift (University of Arizona Press). He is of the Bįį’bítóó’nii’ Tódi’chii’nii clan and is born for the Tlizilłani’ clan. He is from White Cone, Arizona, on the Navajo Reservation. His honors include the 2011 Lannan Literary Fellowship, a Native Arts & Culture Foundation Fellowship for Literature, a PEN Open Book Award, an American Book Award, and a Whiting Writers Award. Bitsui teaches for the MFA in Creative Writing at the Institute of American Indian Arts.